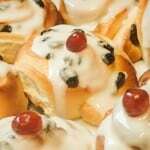 Delicious homemade Belgian Bun better tasting than the bakers and easy to make. Included are the recipes for making by hand and using the dough setting on your bread machine. Leave this for around 20 minutes you will see the yeast working. In a bowl mix the flour and salt. Cube up the butter and then rub in using your fingers to make a breadcrumb consistency. Stir the sugar into the dry ingredients. Gradually mix in the flour from around the edge to make a soft dough - if it's too dry then add some more milk to the mix but make sure it is at least room temperature. Knead for around 5 minutes until it's smooth and elastic. Put it in a clean bowl and cover with a dish towel for around 2 hours - make sure it's in a warm location otherwise the dough will take much longer to double in size. Once the dough has doubled in size knead again for approximately 2 minutes and then roll out. Spread with the lemon curd and then sprinkle on the handfuls of raisins. Cut into 9 or 12 small pieces. Place on a greased baking tray and leave for the second rise for around 30 minutes again make sure it's in a warm place. Pre-heat the oven at 200C and bake the buns for 20 - 25 minutes until golden brown. Make up a frosting with the icing sugar and water to a thick paste. Remove the buns once cooked and place on a wire rack to cool down. Once they have cooled add the icing and place a cherry on the top. Add the ingredients to the bread maker in the order recommended in your instruction guide or as follows - Flour, salt, sugar, melted butter, egg, warmed milk and yeast. Put the mix on the dough cycle and leave to work. Once the dough cycle has finished turn out onto a lightly floured surface. Knead for 2 minutes and then roll out the dough. Continue with the above instructions from "Spread with the lemon....."